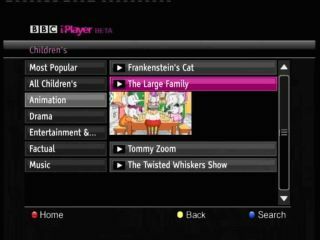 The BBC's iPlayer has will launch in beta on Freesat from December 7, with ITV's VOD service launching on the satellite platform in the first half of 2010. Anyone with a Freesat HD TV or Freesat HD box (and ethernet connection) will be able to get the iPlayer service eventually, although the beta is only for journalists and partners for the time being. "During the initial stage of [the] beta, selected journalists and partners will be able to access the service using a code," explains the official release. "We hope as many Freesat viewers as possible will be able to use the service by Christmas and without the need for a code," it continues. BBC iPlayer on Freesat has been talked about for a long time, but the belated arrival of the service is still a key moment for the platform. Freesat HD boxes and TVs will become a hybrid IPTV/Satellite service – giving full video on demand through the Ethernet internet connection and linear 'live' television through the satellite. A minimum connection speed of 1Mb/s is needed, with 2Mb/s needed for the highest available quality – although this may eventually become better. Sky is also working on a hybrid solution for its own boxes, but has not yet announced when such a product will be launched. Emma Scott, Freesat's Managing Director, comments, "We're delighted to be able to offer BBC iPlayer to our viewers. "All the HD receivers that have been bought and will be sold in the run up to Christmas will deliver BBC iPlayer so there'll no need to buy any new receivers. "There's a great schedule of programmes be available on BBC iPlayer in the lead up to Christmas with the likes of The Gruffalo, the EastEnders Special and Doctor Who. "BBC iPlayer has been fantastically successful online so being able to offer viewers the ability to watch it in their living room on a subscription free TV service for the first time will be transformational. "We'd like to thank the BBC for all their hard work bringing the service onto our platform." The service can be launched through the red button on BBC channels.